Mary Teresa Cannon passed away peacefully at the age of 87, in the loving care of her family on the morning of Sunday, May 18, 2014 at her home in Nottingham, England. She was predeceased by her husband James (Jim) Cannon, who passed away at the age of 65 on September 4, 1980. Mary was born on September 9, 1926 in Cree, County Clare. She was the second child of four children born to Michael and Elizabeth Guthrie (nee Reidy). Her brothers are Paddy and Joseph (predeceased) and sister, Bridget. As a child, Mary attended the local school and St Mary’s Church in Cree. From the young age of 14, she spent two years boarding at the Convent of Mercy, School of Domestic Economy, Dungarvon, County Waterford. She moved back home with her parents and later moved to Belfast employed as housekeeper for the family of Sean MacEntee, the then Teachta Dála and later Minister for Local Government and Public Health in Ireland. 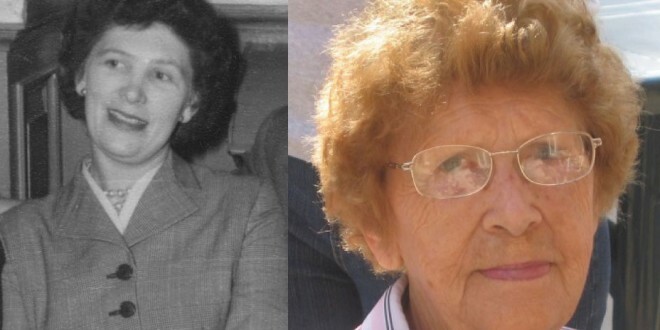 Mary emigrated to England in 1946 and settled in Nottingham to work at the Raleigh cycle factory and later, as her children grew up, as a school dinners supervisor. Mary and Jim were blessed with seven sons and one daughter Charles (Michael), James, Joseph, Peter, Christopher, John, Maria (Marie) and Patrick, of whom they were immensely proud. Mary was only 53 years of age when her husband Jim passed away. Nevertheless, with her faith and strong determination, she continued to provide in every way for her large family. Mary’s home was a place where family and friends felt welcomed and cherished. Her warm and loving nature was respected and loved by all who knew her. Mary is sadly missed by her sons, daughter and daughters-in-law Natalie, Jenny, Rita, Sue, Gail and Julie. Also her 16 grandchildren Helen, Steven, Clare, Sean, James, Dirk, Claudia, Patrick, Rory, Matthew, Charlie, Hamish, Douglas, Alistair, Kezia and Leah, together with her nine great grandchildren, Madeleine, Alexander, Thomas, Lisa, Rudi, Beau, Maggie, Hendrix and Joe and her cousins, nephews, nieces, extended family, neighbours and a wide circle of friends. Mary’s funeral service will take place at St Paul’s RC Church, Lenton Boulevard, Nottingham, commencing at 12.15pm on Monday, June 2. She will be interred at 1.40pm and laid to rest with her late husband James at Wilford Hill Cemetery, Nottingham. May her kind and gentle soul rest in peace.